"I only use a camera like I use a toothbrush. It does a job." "To create pictures powerful enough to overcome the diluting effects of the mass media, to shake people out of their indifference." "We are only trying to tell a story. Let the 17th-century painters worry about the effects. We've got to tell it now, let the news in, show the hungry face, the broken land, anything so that those who are comfortable may be moved a little." "Go forward with the label of photojournalist and keep the rest in your heart." "If your pictures are not good enough, you are not close enough." "To me, photography is the simultaneous recognition, in a fraction of a second, of the significance of an event as well as of a precise organization of forms, which give that event its proper expression." "I am a visual man. I watch, watch, watch. I understand things through my eyes." "You cannot rely on your memories - but you can rely on your pictures." "For me, it was just important to photograph what I was part of." 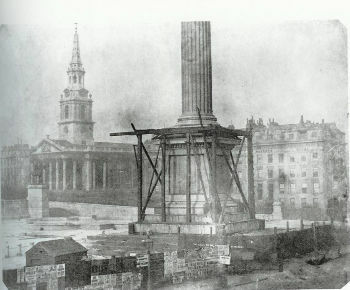 1843, Henry Fox Talbot uses his Calotype camera to “inform the public” on the construction of The Nelson Column monument in London's Trafalgar Square. 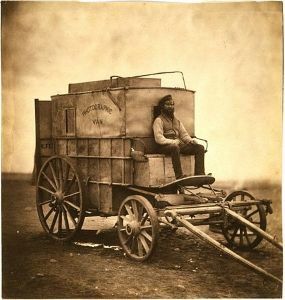 Roger Fenton photographs his colleague Marcus Sparling seated on Fenton's mobile darkroom in Crimea in 1854. In 1854, meanwhile, the British photographer, Roger Fenton, urged by Prince Albert and the British Secretary of War, headed for Crimea. The British government hoped that photographic images might boost the people's moral support for the unpopular war effort. Fenton's desolate landscape, The Valley of the Shadow of Death, became his most famous photograph. The location, near Sevastopol, was known as "The Valley of Death" after the elite British Light Brigade sustained heavy casualties when ordered to charge a heavily fortified Russian position that overlooked the valley. Fenton's image resonated with the British public as did his panoramic images. For the latter, Fenton had set up a camera in a chosen location and then rotated it for a series of shots which rendered - in pictures - the experience being on the front lines. Fenton's photographs appeared in the Illustrated London News in 1855 and were also put on public display widely throughout England. Fenton also presented his work to Queen Victoria, the French Emperor Napoleon III, and other royal dignitaries who quickly realized the important role Photojournalism could play in forming a national consciousness. Matthew Brady with members of his photographic team pictured while covering the American Civil War. Matthew Brady was an acclaimed New York portrait photographer and one of the first to launch his own studio in 1845. The outbreak of the American Civil War in 1861 created a new demand amongst his clients for photographs of conscripted relatives leading Brady to develop an interest in war photography. It was President Abraham Lincoln no less who granted Brady permission to travel to battle scenes (with the caveat that Brady cover his own expenses). Brady assembled a team of 24 photographers whose photographs of the First Battle of Bull Run became especially well known, with several being published in Harper's Weekly. Though they offended the tastes of the public at large, The New York Times commented that "The faithful camera...has written the true history of the war. It is not merely what these representations are to us, but what they will be to those who come after us." At the start of the 1860s, a major trend in Photojournalism emerged with the camera being employed as a tool to highlight the plight of the poor and needy in industrial societies. 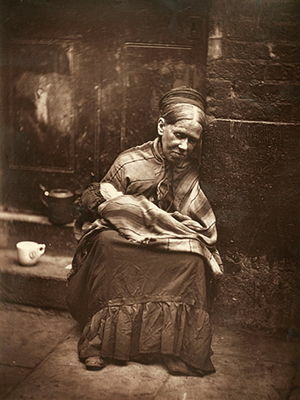 Having travelled with his camera throughout Southeast Asia and China (the idea of colonial photography, and the colonial "postcard" in particular, becoming a field of photography in its own right), the Englishman John Thomson returned home in 1872 when he used his camera to expose social inequalities in Victorian England. His famous collection, Street Life in London, comprised of 37 photographs, was supported by essays by Adolph Smith Headingly and is often cited as among the first to match written essays with photographic images. In 1877 Jacob Riis used his camera to expose a world of crime and poverty of New York City's East Side slum district. In the United States meanwhile the photographer Jacob Riis (know as an innovator in flash photography) documented the grave living conditions in the tenements of New York City. A Danish emigre, Riis found work as a journalist, a newspaper editor, and a police reporter and was a strong advocate of social reform. 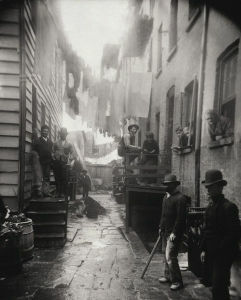 Eighteen of his photographs appeared in a photo essay "How the Other Half Lives" in Scribner Magazine's 1889 Christmas edition and included images like Bandit's Roost (1888), which depicts a number of shadowy men standing along a narrow street which was located in the most crime-ridden area of New York City. The work of Fenton, Brady, Thompson, Riis and the like helped establish the conventions of Photojournalism. And though it is problematic to speak of a "golden age" for a genre that tends to focus on human suffering, the so-called "golden age" of Photojournalism began, nevertheless, around 1930. Lasting a period of roughly 30 years, it has come to be considered exceptional because it gave rise to several noted photographers who between them helped expand the genre by exploiting innovations in camera technology. The "golden age" also coincided with the rise of popular photographic magazines like LIFE, Look, Regards, and Paris Match all of which carried the work of distinguished photojournalists. The development of portable cameras with faster exposure times, including the Filmo 70 16mm movie camera and the 35mm Leica, gave photographers more mobility and a better chance of capturing live action. Robert Capa became the pre-eminent war photographer of his generation and remains best known internationally for The Falling Soldier (1936); a photograph that caught the instant when a Republic soldier in the Spanish Civil War was felled by an enemy bullet. Henri Cartier-Bresson, meanwhile, earned the title of "father of Photojournalism" thanks to his uncanny ability to freeze noteworthy events in what became known as his "decisive moment". The Frenchman covered occasions ranging from the coronations of King George VI and Queen Elizabeth II, to the Occupation and Liberation of France during and after WWII. In the 1930s, Social Documentary was an expansive artistic movement that welcomed photojournalists into its ranks. Between 1935 and 1944 Photojournalism in the US was exemplified by projects undertaken under the auspices of the Farm Security Administration (FSA). The purpose of the FSA project was to highlight rural (rather than urban) poverty and it brought international recognition to the likes of Dorothea Lange, Walker Evans, Arthur Rothstein, and Gordon Parks. Major national disasters like the Dust Bowl drought and the Great Depression, events driven by weather patterns and economic situations respectively, were shown through the personal impact they had had on individuals. The success of the FSA project was such that magazines such as LIFE employed staff photographers such as Margaret Bourke-White to cover events of national significance (such as the flooding of Louisville, Kentucky in 1935). Following the rise of Nazism, photojournalists turned primarily towards documenting the turmoil of WWII. Bourke-White was the only Western photographer to witness the German attack on Moscow - known as the "Battle of Moscow" - in 1941 and she was the first woman to accompany US Air Corps crews on bombing missions in 1942. She also travelled with General Patton through Germany as his armies liberated a number of concentration camps. Between 1941- 46, Robert Capa (the Hungarian had relocated to New York from Paris where he had been a colleague of Cartier-Bresson) worked as a freelance photographer and war correspondent for LIFE and Collier's magazine. He was the only official American photographer to accompany the Allied troops on the D-Day landings and he also covered Allied victories in North Africa, and the Allied seizure of Leipzig, Nuremberg, and Berlin. In 1947, Capa, Cartier-Bresson, George Rodger, William Vandivert and David "Chim" Seymour formed a photographic cooperative that gave its members the freedom to photograph (and to own the copyright of) what they saw rather than be beholden to the demands of magazine editors. Magnum's mission statement proclaimed to "feel the pulse of the times," and it launched a number of long-running photographic projects including People Live Everywhere, Youth of the World, Women of the World and The Child Generation. Photographic coverage of geographical areas was split meanwhile among the core group: Roger covered Africa and the Middle East; "Chim" covered Europe; Cartier-Bresson covered China and India while America became Vandivert's territory. Capa was the exception, more a free-roaming figure was who would work worldwide. Each of the photographers became associated with their coverage of subsequent events, as was the case for instance with Cartier-Bresson who covered the assassination and funeral of Mahatma Gandhi in 1949. Given the need for long exposure times, and the need to place their camera on a tripod, the early war photographs by the likes of Fenton and Brady were of a somewhat static quality. 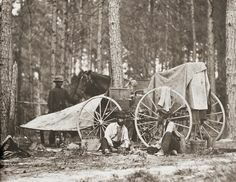 Their images were largely restricted to pictures of military camps, generals in their tents, or decimated battlefields. The photographs of Thomson and Riis also lacked any real sense of mobility but their capacity to shoot in under lit urban environments was made possible by the development of a flash mechanism. The pocket Kodak was available from the late nineteenth century but lacked professional quality. That was remedied between the mid-1920s and mid-1930s when the Leica 35mm compact and the Filmo 70 16mm movie cameras brought with them a new sense of liberation. War photojournalists like Gerda Taro and Robert Capa could film battle scenes as they happened, and photographic coverage of conflict, whether war or civil unrest, began to dominate the news. Technology has continued to change Photojournalism with the development of the smart phone and the ability to upload images almost instantaneously to the web. The New York Times and Washington Post both ran headline images taken by ordinary citizens on their camera phones during the 2005 London bombing. In 2013 the Chicago Tribune laid off their photojournalistic staff, including John H. White whose work had previously won a Pulitzer prize, and began using freelance photographers who were trained to use an iPhone. Due to the technology of the camera phone, a new kind of everyman-photojournalist has resulted. With the rise of many photo magazines, and the overall turn of the medium to a greater reliance on imagery, the so-called "photo-essay" became a popular method for covering news and human interest stories. On the one hand, photo-essays focused on events of national significance; on the other, photo-essays reflected a humanist perspective (and sometimes the two would overlap). Most of the noted photojournalists working in the mid-to-late-twentieth century - including W. Eugene Smith, Cartier-Bresson, Dorothea Lange, and more recently, Josef Koudelka, Sebastião Salgado, and Gabriela Iturbide - have worked (or continue to work) at one time or another in the photo-essay format. When LIFE magazine suspended publication in 1972, various critics felt that the photo-essay was dead, but, in fact, it has remained a viable form, though more so in book publications and exhibitions. 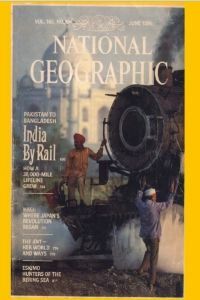 Steve McCurry's famous 1984 cover for National Geographic - which McCurry allegedly had to reshoot, literally making the train go back as the first shot was not sharp enough. Given its integral relationship with journalism, Photojournalism came under the rule of the same ethical codes. In the years following World War II, quality Photojournalism insisted on a number of stipulations: no posing or posturing, no artificial lighting, no manipulation of the scene, and no darkroom manipulation beyond cropping or lightening and darkening. All manipulation cast aspersions upon the status of the photograph and, by extension, the reputation of the photographer. 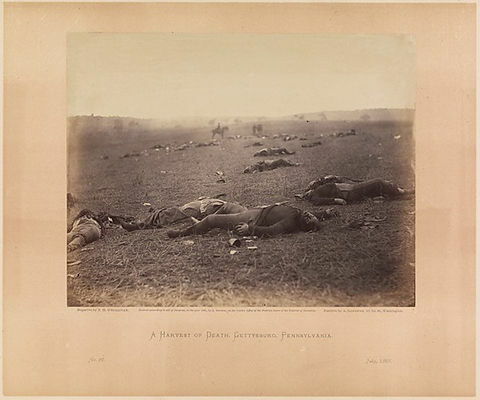 In the modern era, early examples of Photojournalism (including Fenton's Valley of the Shadow of Death) have been subject to revision as questions concerning image authenticity have become more pressing. The matter of truthfulness continues to be a professional concern in contemporary Photojournalism. However, the pressure to act as an objective onlooker has often been at odds with the photographer's humanitarian instincts. The South African photographer Kevin Carter became well known for his The vulture and the little girl (1993) that shows a famine stricken Sudanese child (who was in fact a boy) being stalked by a vulture. When the image appeared in The New York Times, there was a justifiable public outcry as many readers felt that Carter had a moral duty to go to the child's aid (which he did) before taking his photograph. Photojournalists are faced with the same fundamental problem as street photographers: that being the moral quandary of exploiting the lives of strangers for their own gain. However, those in conflict zones will often encounter people suffering in the most wretched of situations, and where that is the case, then the photojournalist can rationalize their actions given that they have undertaken to bring a particular human or political crisis to the attention of the wider world. Yet what is truly unique to the photojournalist covering political unrest or war is the element of personal risk from imprisonment and even injury or death. Indeed, Capa, Taro, and "Chim" all died while photographing combat situations. There can be a psychological cost too. Carter, stating in his suicide note that he was "haunted by the vivid memories," took his own life just four months after winning the 1994 "Pulitzer Prize for Feature Photography" for The vulture and the little girl. Reporting on the death in Syria of the American foreign affairs correspondent and British journalist Marie Colvin in 2016, Tom Seymour of The Guardian noted that, since 1992, some 1,197 photojournalists had lost their lives in conflict situations. Seymour had put this depressing statistic down to the fact that all the major news publications had closed down their foreign bureaus and had come to "rely more and more on independent photographers working without the backing of a large organisation and on a shoestring budget" with the result that photojournalists were now even "targeted as enemy combatants." In 1973 Tom Wolfe edited the anthology The New Journalism, a term coined by Wolfe to describe a style of journalism that reported on a broad range of subject matter over an extended period of time. New Journalism, sometimes referred to as "literary journalism," could be less objective and adopt an experiential or interpretative approach to factual material. Examples of "New Photojournalism" can be found in the photo-essay approach of Eugene and Aileen Smith's Minamata (1975), which documented the effects of methyl-mercury poisoning on inhabitants of the Japanese village of the same name, and Lauren Greenfield' s Girl Culture (2002) which explores the lives of modern American girls through the theme of identity and self-image. Mary Ellen Mark's Streetwise (1988) meanwhile started as commissioned project but Mark struck up an intense relationship with the street children of Seattle, one of whom was a thirteen-year-old prostitute nicknamed "Tiny." Indeed, having turned down her offer of adoption, Mark consistently returned to photograph her "confidant and friend" until the photographer's death in 2015. At its most rudimental, Photojournalism is a means of telling news stories with pictures. It is then highly problematic to talk of Photojournalism as art. And yet, like art, photojournalism has the power to transform the way people see the world. It is true that several noted photojournalists have been trailblazers in other photographic movements. Cartier-Bresson's work, as both a photojournalist and street photographer, set the standard for both fields for several decades, while iconic images produced in the name of the FSA saw the likes of Walker Evans, Gordon Parks, and Dorothea Lange attain the status of artist. However, Photojournalism has provided inspiration for artists working in the late-1970s and 1980s such as Sherrie Levine whose conceptual art directly copied Evan's iconic image of Allie Mae Burroughs. Levine, with Cindy Sherman and Richard Prince, used photography to examine the codes of representation and meaning through manipulation and appropriation of existing material including Photojournalism. Their work became landmarks of postmodernism. Other artists, including Sam Samore, Anne Collier, and Simon Brann Thorpe, have also drawn upon the history of Photojournalism to inform their art. Thorpe's Toy Soldier No. 61 The Falling Soldier (2015), for instance, references Capa's Falling Soldier in a project where real soldiers posed as plastic toy soldiers in the Sahara Desert as a way of exploring forgotten conflicts (in the Western Sahara in this instance) and how modern spectators have become desensitized by exposure to so many images of death and suffering. 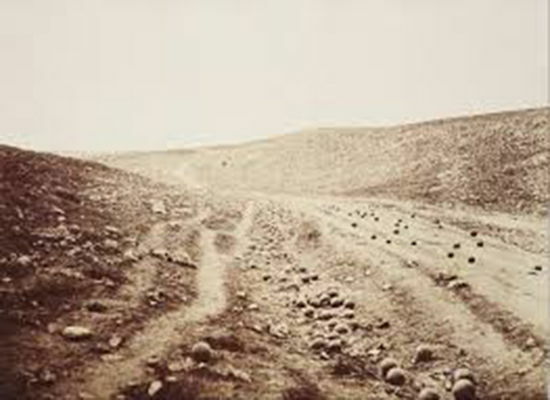 Fenton's image, which depicts a ravine in a desolate landscape beneath a bleak empty sky, is populated only with cannonballs. Strewn along the road on the right, and filling the ditch between the road and two paths on the left, the cannonballs are meant to represent British casualties of the Crimean war. The perspective of the photograph, looking up toward the sloping hills and around the incline of the road, captures something of the sense of hopelessness at being trapped in a valley under enemy fire from above. As Fenton described it: "the sight passed all imagination: round shot and shell lay like a stream at the bottom of the hollow all the way down, you could not walk without treading upon them." This barren war landscape would have resonated with the British national consciousness. Most had heard the story of "The Charge of the Light Brigade," an elite cavalry unit that sustained heavy casualties when ordered to charge through the Valley of the Shadow of Death toward fortified Russian artillery on October 25, 1854. The event was commemorated in a poem of the same title by Alfred Lord Tennyson, the poet laureate. The location in this photograph is of a similar but different ravine, and the image came to represent the heroism and tragedy of war. It transpired, however, that Fenton photographed the ravine on two separate occasions. Subsequently, controversy developed as to whether some of the cannonballs were placed to make a better second image. Thus, while the image remains of great historical significance, it is also attended by the issue of authenticity which underscores all judgements on the value of Photojournalism.